What a special capture! Adorable. Thanks Andrea, for the nice comment and fave of my work! Thanks Janette, for the nice comment and the F/L. I really appreciate it! Thank you Denise, for taking the time to view and leave this nice comment! fuzzy little buddies, keeping warm and close for the night - great photo, Brian! Thanks Lois, for the nice comment! This is adorable...made it a favorite. Nicely framed, also. Thanks Beth, for the nice comment and fave. I always appreciate the time it takes to respond! Thanks Carol. You and I get the same feelings from this image. I had never seen anything like it before. Thanks for the like as well. Thanks for the fave Angela! Thanks for commenting Diannah. This was something that I'll probably never see again and I'm so glad a captured it. Thanks for the Like, fave and vote!!! Thanks for the fave Kym. I love birds and this gave me a lot of pleasure. Snuggling is a good way to keep warm. 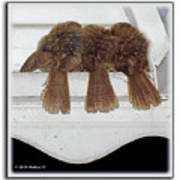 The tail feathers with all those stripes look almost like young wrens. I like and thank you for sharing. Thank you Mary for the kind words. I'm glad you liked my image. I'm told these birds are actually "House Finches". 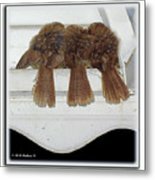 They look very similar to the Purple Finch except their bills are the primary difference. Thanks Sherry! I appreciate the vote! 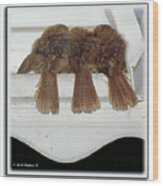 I would love to forward you several pictures that I have taken but not sure how to get it to you. 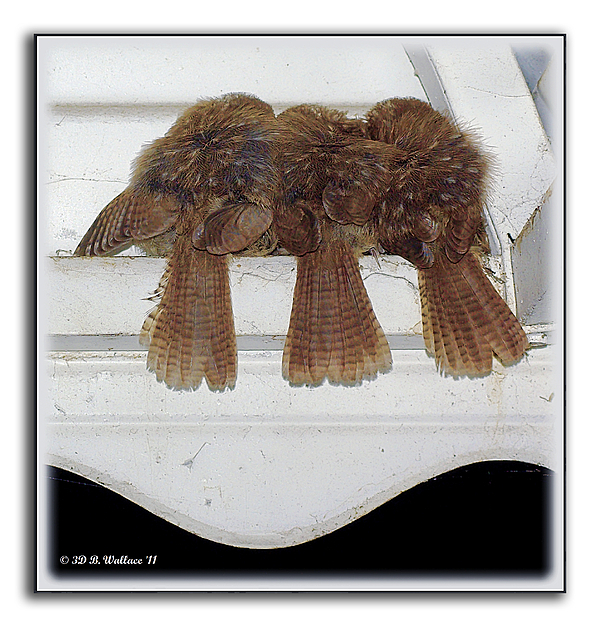 2D image of 3 baby house finches huddle together under my awning in Pasadena, Maryland.